ਪਹਿਲਾਂ ਜਿਹੜਾ ਰਣਜੀਤ ਸਿੰਘ ਨਾਂ ਦਾ ਟਾਊਟ ਫੜਿਆ ਗਿਆ ਸੀ ਜਰਮਨ ਕੋਰਟ ਨੇ ਉਨੂੰ 9 ਮਹੀਨੇ ਦੀ ਸਜਾ ਦਿਤੀ ਸੀ, ਕਿਉਕਿ 9 ਮਹੀਨਿਆਂ ਵਿਚ ਬੰਦਾ ਬਣ ਜਾਂਦਾ ਹੈ। ਪਰ ਵਿਚਾਰੇ ਜਰਮਨ ਲੋਕਾਂ ਨੂੰ ਪਤਾ ਨਹੀ ਕਿ ਜਿਹਨੂੰ ਗੁਰੂ ਨਾਨਕ ਨਾ ਸੁਧਾਰ ਪਾਇਆ ਉਹ 9 ਮਹੀਨੇ ਤੁਹਾਡੀ ਜੇਲ ਵਿਚ ਰਹਿ ਕੇ ਕਿਵੇ ਸੁਧਰ ਜਾਉ। ਜਿੰਨਾਂ ਨੂੰ ਚੁਗਲੀ ਦੀ ਆਦਤ ਪੈ ਜਾਏ ਉਹ ਕਦੋਂ ਬਾਜ ਆਉਦੇ ਨੇ। ਰਣਜੀਤ ਸਿੰਘ ਨੇ ਪਤਾ ਕੋਰਟ ਵਿਚ ਕੀ ਬਿਆਨ ਦਿਤਾ ਸੀ, "ਅਖੇ ਜੀ ਮੇਰਾ ਟੱਬਰ ਇੰਡੀਆ ਵਿਚ ਹੈ ਜੇ ਮੈਂ ਜਸੂਸੀ ਨਾਂ ਕਰਦਾ ਤਾਂ ਇੰਡੀਆ ਵਾਲਿਆ ਮੇਰਾ ਟੱਬਰ ਮਾਰ ਦੇਣਾ ਸੀ। ਇਸ ਕਰਕੇ ਮੈਂ ਤਾਂ ਮਜਬੂਰੀ 'ਚ ਗੂੰਹ ਖਾਂਦਾ ਰਿਹਾ"
Indian secret touts in Germany feel harassed. A second case is registered against them. KOBLENZ, Germany—In the Koblenz, Germany espionage case, an accused man from India has been sentenced to a prison term of nine months because of secret service agent activities. 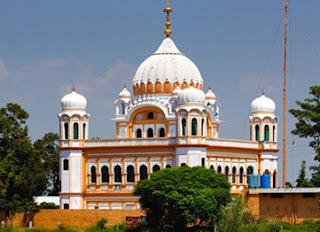 Ranjit Singh had procured information about Sikhs living in Germany and passed the information on to an employee of the Consulate General of India in Frankfurt, said the first Criminal Division of the High Court on Monday. The 45-year-old had been aware that his contact man worked for a secret Indian domestic intelligence service, most likely the Intelligence Bureau (IB). “The defendant acted intentionally. We can not tell of any evidence of coercion” said the presiding judge. The federal prosecutor had called for one year and three months imprisonment. Both the prosecution and defense did not want to even comment on a possible revision on Monday. The monitored people were mainly members of Sikh organisations according to the presiding judge. The multiple convict Ranjit Singh was able to draw on an extensive network of Indian residents in Germany in his search for information. He had such a network due to his previous activities as smuggling. No detectable loss was incurred by the people who the defendant collected information upon. The investigators discovered the use of telephone monitoring however the court was unable to conduct examination of the consulate employee. The court stressed that the punishment for Ranjit Singh could not be placed on probation. He was a failed asylum seeker who had entered Germany with a fake passport in 2002 and most recently lived in Ludwigshafen. Officials from the Federal have arrested a 58 - year-old man in Bielefeld morning . 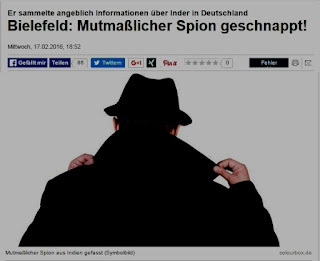 The man who is a German citizen , is accused of spying for Indian intelligence service in Germany . As the Attorney General announced the evening , the suspect had pried living in Germany Indians , especially opposition and Sikhs . he forwarded the information gathered by him then allegedly to his authority . Brisant : The alleged spy was employee of the central aliens authority in East Westphalia . He had also access to confidential information , they say. The officers ransacked the morning both his office and his private property . The 58 - year-old will tomorrow brought before the investigating judge of the Federal Court , which will open to him the arrest warrant and decide on the execution of detention.